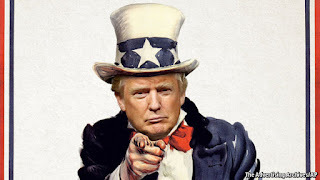 In this post, I argue that the ascent of Donald Trump in the US presidential race is a symptom of the ongoing breakdown of society, in turn caused by the loss of control generated by resource depletion. At the bottom of this post, you'll find a simple system dynamics model describing the situation and generating another example of "Seneca Collapse"
Donald Trump seems to have taken everyone by surprise. Whether or not he gains the Republican nomination, and whether or not he becomes president, he took the media by storm: people writing on blogs and newspapers are reeling from the impact, asking themselves: where the heck did this come from? What is he? A God? The reincarnation of Hitler? Or of Mussolini? The devil? Or what? Personally, I don't claim to have been less surprised than most by Trump but, rethinking about the situation, I think it is reasonable to say that something like Trump was unavoidable. He is, really, best defined as the visible effect of the ongoing social phase transition. A discrete change in our path in the direction of collapse. For a good number of years, I have been studying the reasons for the collapse of societies. And, at the beginning, I tended to explain it as mainly the result of the depletion of crucial resources; crude oil, in our case. But, the more I think about that, the more I understand that the relation between depletion and collapse is far from being straightforward. A society can very well collapse without running out of anything; think of the case of the Soviet Union. When it collapsed, the Union had still plenty of mineral resources, but it couldn't find a way to exploit them in a convenient manner. In the case of the Roman Empire, also, there is no evidence that it run out of food or of any basic resource. Rather, it ran out of the resource it used for paying its troops, gold and silver for its currency. In both cases, it was a question of the collapse of control. As we all know, power without control is nothing. 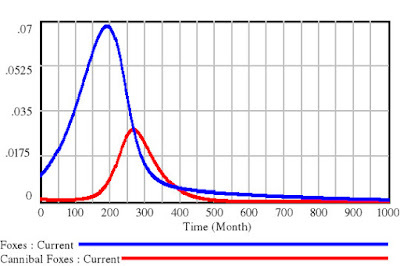 Note that the loss of control is related to resource depletion, but the relation is not direct. It works like this: any complex society can exist only in certain conditions: it is not enough to have access to natural resources. It is necessary to be able to distribute these resources in such a way to keep all the sections of society supplied; this is a question of control. You can also use the term "governance" if you like to avoid a term that has a military ring to it. The point is that if a society is unable to allocate the resources in such a way to make most people accept the way they are allocated, it will break down, or collapse, or both things. In our world, resource allocation is controlled by the entity we call "the market", with some correction on the part of another entity that we call "the government". Generally speaking, the government is supposed to correct for the fact that the market is not supposed to provide a fair distribution of wealth. For instance, the government is supposed to provide health care services even to people who can't afford it. This is why taxes are progressive (or used to be, before president Trump took office). This is what we normally call democracy: it works on the shared belief that society is kept together by a certain degree of fair sharing of the available resources. It works, but only in some conditions. In particular, it works under the assumption that the available resources are relatively abundant. If that's the case, it is more convenient to create new wealth by exploiting some untapped resource than to steal wealth from others who already have it. But that's not always the case. Lets'imagine that you are out of your job. In normal conditions, you look for another job. But if there are no jobs available, or you are too old to get a new job, your only possible survival strategy is theft or robbery (it is happening). Then, if those Arabs are sitting on our oil, then it makes sense to bomb them to smithereens and get it. And why should the poor get our money for their health problems? Note that you don't need to run out of anything to cross the critical point. Within some limits, you may assume that the cost of exploiting a natural resource goes up with the inverse of the resource abundance while the cost of stealing it from someone who has it may be taken as approximately constant. So, there has got to be a point where stealing becomes a better strategy than finding new resources. 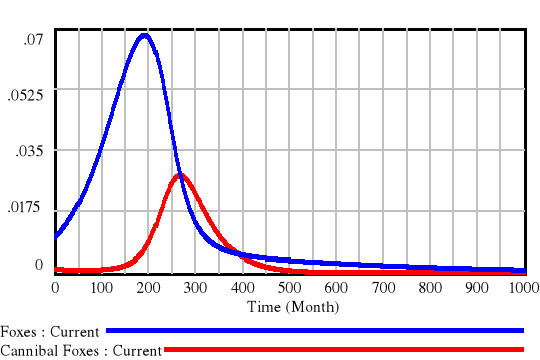 It is a phase transition in society (see the model, below). At this point, society goes to a crisis that leads it either by some form of breakdown, including "ethnic cleansing," or to some kind of centralized military control. The second outcome can be said to be better than the first. That's what the Romans did when it moved from a republic to an Imperial system. That's the path in front of us. If we see the situation in these terms, then Trump is, really, nothing unexpected. He is a symptom of the ongoing breakdown of the social pact in the US and all over the West. Indeed, he is capitalizing on this breakdown by using his aggressive rhetoric, playing on the attempt of the white (former) middle class to maintain at least some of its previous prosperity and privileges. Trump is not (yet) an emperor and probably he'll never be one. But he is a step in that direction; an unavoidable consequence of resource depletion. When the first barrel of oil was extracted from underground in 1859, it might have been possible to imagine that depletion would cause big problems, at some moment in the future. It would have been impossible to imagine that, one century and a half later, it would lead to a presidential candidate with carrot-colored hair whose motto could be "we shall overcomb." But so is the future: it always surprises you. Here is a simple model that explains the transition of a complex society from a strategy mainly based on exploiting new resources to one based on the theft of resources from those who have them already. The model is based on the well-known "Foxes and Rabbits" model; where we assume that foxes are the predator and rabbits the prey. 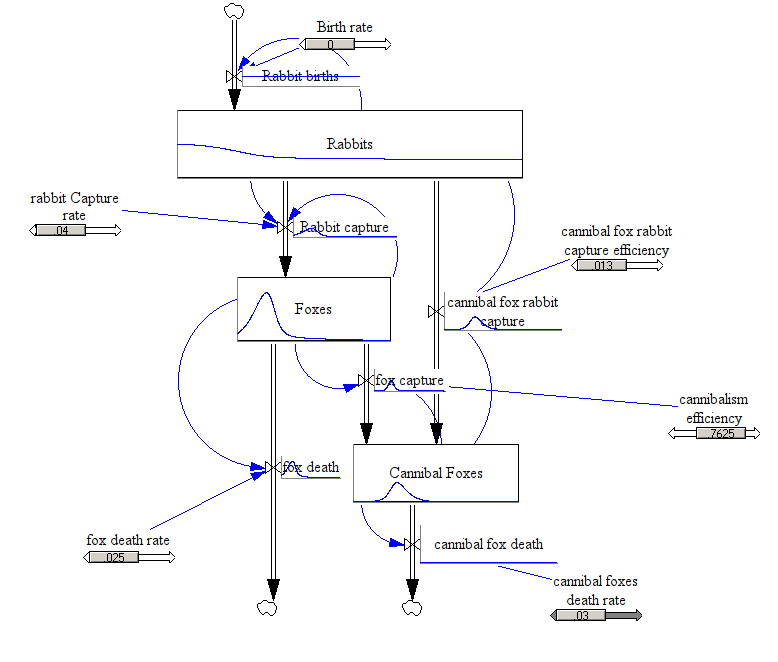 Here, we examine only a single cycle of the model; assuming that rabbits reproduce too slowly to make a difference. For more details on how this model works and how it can be used to fit historical data, take a look at this paper of mine. To describe the phase transition, I assume here that some foxes can become cannibals and eat other foxes. These cannibal foxes can use a double strategy, if rabbits are abundant, they will eat rabbits, but if they are not, they will eat other foxes, especially if the latter are very abundant. 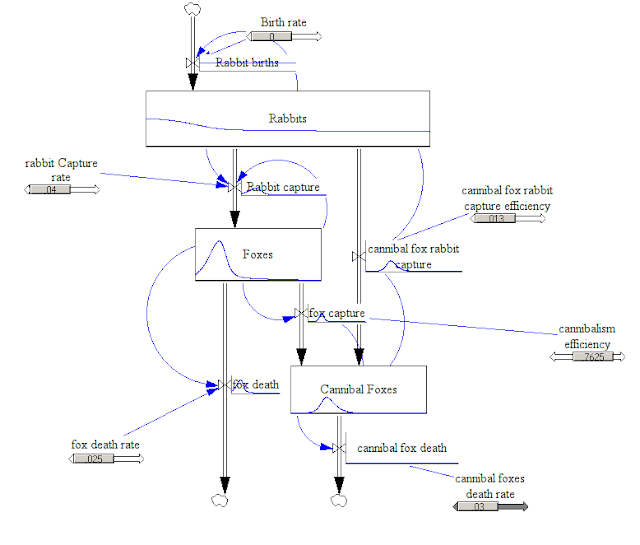 Here is the model, implemented using the standard conventions of system dynamics and the "Vensim" software. You can see how the cannibal foxes grow as a "parasite" of the regular foxes, causing their population to collapse more rapidly than it would have done without the cannibals. It is another example of the "Seneca Collapse". This is, of course, a very simple model, but I think it conveys the basic mechanism of the breakdown of society. This breakdown occurs not when society actually runs out of anything, but much earlier. That seems to be what's happening to us and Donald Trump is just a symptom of the change. The work of Henry Giroux comes to mind. This is a tremendously fruitful notion, a society collapsing through a sort of Seneca mechanism because it starts to consume itself, thereby inducing a loss of cohesion within social structures. This loss of cohesion manifests itself in disparate ways. It is probably all correlated, or so it seems to me. Once resources become scarce, the strongest sections of society start a predatory activity on the weaker ones. The elites, right now, are predators of the middle class; simply because there is little to take away from the really poor people. That would explain the increase in income inequality. Admittedly, a somewhat simplified model, but what other model can explain this behavior? While Trump seems like what we might consider an extreme-right wing candidate, often compared to Mussolini and even Hitler, the other top two, Cruz and Rubio (now out of the race), are / were by all accounts much worse than Trump. Nearly everyone who says how bad Trump is seems to overlook this. Whether intended or not, this post would seem to validate Ugo's point - that Trump's candidacy is not a bizarre fluke, but rather a symptom of a social system in disequilibrium. For the 2016 election cycle, the U.S. social arrangement has coughed up a whole series of other Republican candidates spouting effectively similar positions to Trump's, but using more euphemistic language (i.e., "dog whistles") to describe their proposed policies. Its debatable whether Trump would be worse or better than Hillary for the U.S. I think notwithstanding the fact that nobody makes money in the construction business in Queens and Manhattan without ties to the Mob, Trump probably has less of a criminal history than the Clintons in Arkansas running drugs. Hillary also was a major force behind the destruction of Libya. And a lot of the rest of the Middle East too. More than anything to do with longer term collapse, I think both Sanders and Trump are proof that Americans are fed up with establishment candidates, though they may be in for a rude surprise with Trump. I dont think the U.S. is near collapse though the U.S. Dollar could be. One interesting and tantalizing thing is that Trump and Putin seem to like each other. A thoroughly U.S Russia aliance would turn the current World Order upside down . Maybe that could be good? And of course lots of despicable people wouldn't like it at all and would be scrambling behind the scenes to get a seat at some of the new tables. But if Trump is not actually part of the establishment himself and is not playing a game, he probably should watch his back. Some of those folks play for keeps. I don't know what is more pathetic: actually taking Trump seriously or yet another "trumped up" criminal charge against the Clintons. "Running drugs", really? It is a tragedy that US society can't come up with better candidates for high office than we have seen this year. In normal times all of the candidates from both parties would be laughed off of the stage, including Hillary Clinton. She is certainly the only candidate left standing with any credible qualifications for the job of president. Right wing fanatics have been trying to pin a felony on her and Bill since the death of Vince Foster. None have had any merit. The opinion of Prof. M. Pettis, professor of finance at Guanghua School of Management at Peking University in Beijing, is that the surprising political appeal of Mr. Trump is not so surprising if viewed from the US histrorical perspective. "The Jacksonian tendency in American politics has existed throughout American history. Their first flag bore the motto “Don’t tread on me”, and all of their subsequent flags have retained that message in one form or another ever since." Intuitively, Trump and Trumpism seem to be yet another illustration of the chaotic behavior of a non-linear complex dynamical system in the region of a bifurcation. Novel behavior becomes more frequent, and the divergence from previously expected behavioral paths becomes more extreme. From a complex-system perspective, Trump seems to be the political equivalent of a double Category 5 cyclone, the recent plummet in oil prices or the Iraq war. Yet another sign that the tipping point is behind us. Like Paul Chefurka, I have strong intuitions that aspects of deep culture coalesce periodically to produce what in hindsight appear to be inevitable aberrations. Scientific and mathematical models to demonstrate such effects are other ways to examine the pattern, but the intuition is widely available to sensitive types, especially poets and artists. Our current cycle may well be a recurrence of events 100 years ago that swept across the West with a ferocious madness. Technological advances (arguably having more to do with information and communications processes than mechanical innovation) probably got us through what many at the time believed to be cultural exhaustion. It’s impossible to imagine what could get us through this phase when today’s history is compounded by ongoing resource depletion and environmental despoliation. Don't be fooled by this impostor!